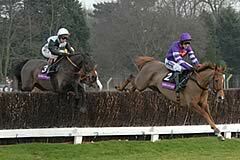 This year’s Grade One Ryanair Chase, which carries record prize money of £250,000, has attracted a superb entry of 43. Paul Nicholls, successful in the race with Thisthatandtother (2005) and Taranis (2007), looks set to have another strong hand in this year’s renewal with Grade Three Boylesports.com Gold Cup victor Poquelin among his five entries. The champion trainer has also entered Grade One winner Herecomesthetruth, last season’s Listed Jewson Novices’ Handicap Chase winner Chapoturgeon, Takeroc and Gwanako, who was fifth in last year’s Ryanair Chase. Imperial Commander landed the spoils in this race last year for local handler Nigel Twiston-Davies and the nine-year-old could re-oppose the second, the Alan King-trained Voy Por Ustedes, who went down by three lengths. Nicky Henderson saddled Fondmort to victory in the 2006 Ryanair Chase and a particularly strong quartet from the master of Seven Barrows includes The Queen’s Barbers Shop, who was third behind Kauto Star in the King George VI Chase at Kempton on Boxing Day. Last year’s Seasons Holidays Queen Mother Champion Chase third Petit Robin could step up in distance following success over two miles in the Grade Two Desert Orchid Chase at Kempton Park in December, while the hugely talented but fragile Jack The Giant may bid to enhance his superb record over fences. Henderson has also given an entry to last year’s Ladbrokes World Hurdle runner-up Punchestowns, who made an exciting debut over fences when taking a Grade Two novice chase at Newbury at the end of November. 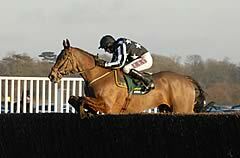 The only other trainer to have tasted Ryanair Chase success is David Pipe, who sent out Our Vic to victory in 2008. The veteran chaser may be joined in this year’s race by stable-companions Pablo Du Charmil and the prolific Consigliere. The Philip Hobbs-trained Massini’s Maguire has run excellent races on both his previous appearances at The Festival, having landed what is now the Neptune Investment Management Novices’ Hurdle in 2007 and been third to Cooldine in last year’s RSA Chase. Hobbs may also be represented by last season’s The Irish Independent Arkle Challenge Trophy Chase third Planet Of Sound, who triumphed in the Grade Two Haldon Gold Cup on his seasonal return prior to taking second behind the Jonjo O’Neill-trained Albertas Run in a Grade Two Chase at Ascot in mid-November. Deep Purple landed a brace of Grade Two contests at Wetherby and Huntingdon for Evan Williams before disappointing in the King George VI Chase, while the Tom George-trained Tartak may also drop back down in distance after taking seventh in the Boxing Day feature. The 2008 Irish Independent Arkle Challenge Trophy Chase winner Tidal Bay, from the stable of Howard Johnson, may bid to improve on the fourth he took behind Imperial Commander in this race last year, while the Venetia Williams-trained Something Wells may also aim for further Festival glory, having triumphed in the Festival Plate last season. Other notable entries include the Donald McCain-trained Will Be Done and Panjo Bere, from the yard of Gary Moore, who landed Grade Two contests last season, the Ferdy Murphy-trained Watch My Back, and Master Medic, successful in a Listed handicap chase for Robert and Sally Alner at Ascot in October. A bumper entry of 18 from Ireland is headed by the Edward O’Grady-trained Tranquil Sea, who notched an impressive four and a half-length success over Poquelin in the Grade Three BetVictor Gold Cup at The Open in November. The progressive eight-year-old, successful in the Grade One Punchestown Novice Hurdle in 2008, was runner-up in the Grade One Paddy Power Dial-A-Bet Chase at Leopardstown in December, which was won by the Willie Mullins-trained Golden Silver. Mullins is responsible for a total of seven entries and the Irish champion trainer could also run Scotsirish, who was third behind Golden Silver at Leopardstown, Grade One scorers Barker and Glencove Marina, Deutschland, Snowy Morning and the only mare among the entries, J’y Vole. The Paul Nolan-trained Joncol stormed to a convincing victory in the Grade One John Durkan Memorial Chase at Punchestown at the start of December before being headed close home to be third in the Grade One Lexus Chase at Leopardstown later the same month, while last season’s The Irish Independent Arkle Challenge Trophy Chase hero Forpadydeplasterer may bid for more Festival glory for Co Kerry handler Tom Cooper. A quartet of entries from Dessie Hughes consists of last year’s third Schindler’s Hunt, who went on to be second in Grade One company at Aintree and Punchestown, John Durkan Memorial Chase runner-up In Compliance and Punchestown Champion Novice Chase victor Rare Bob. The Co Kildare handler may also be represented by recent Leopardstown handicap chase second Siegemaster, who is owned by Ryanair chief executive Michael O’Leary. Newmill gave trainer John Murphy the biggest success of his career when taking the 2006 Queen Mother Champion Chase, while the Irish contingent is completed by Aran Concerto, a three time Grade One winner over hurdles and fences for Noel Meade, the Tom Mullins-trained Made In Taipan and Grade Two scorer The Fonze, from the stable of Eoin Doyle. Class 1, Grade 1, 2m 5f, £250,000 Total Prize Fund. 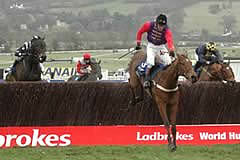 2.40pm, Cheltenham, Thursday, March 18, 2010. For 5yo+ which are allotted a rating of 130 or more by the BHA Head of Handicapping following a review of the horses entered and after taking account of races run up to and including March 11 - horses which are not qualified for a rating in GB, IRE or FR may also be entered & such horses may be eligible providing the Handicapper is satisfied that the horse’s racecourse performances up to and including March 11 would merit a minimum rating of 130 (the decision of the BHA Head of Handicapping shall be final). Weights: 11st 10lb. Allowances: mares 7lb. Entries closed January 12, entries revealed January 14 (43 entries), scratchings deadline February 16, £11,500 supplementary entry stage and six-day confirmation stage March 12. Final 48-hour declaration stage, 10.00am, March 16. Form figures supplied by Weatherbys and are correct up to and including the racing of Tuesday, January 12.